Ottawa, ON, September 15, 2017 – The Canadian Real Estate Association (CREA) has updated its forecast for home sales activity via the Multiple Listing Service® (MLS®) Systems of Canadian real estate Boards and Associations in 2017 and 2018. In Ontario, housing market sentiment has sidelined more buyers than was previously anticipated following changes to provincial housing policies aimed at reining in housing markets in the Greater Golden Horseshoe region announced in April. Activity has begun to show tentative signs of stabilizing among markets in the region, but is down sharply since March amid a rapid shift in housing market balance and increased cautiousness among homebuyers. Because the region is home to a quarter of the Canadian population, changes in sales activity there have a large influence on results for the province and nationally. The downward revision in the national sales forecast primarily reflects the drop in Ontario home sales, which are projected to rebound only partially later this year. Because home prices in the Greater Golden Horseshoe region are well above those in much of the rest of Canada, the decline in Ontario’s share of national sales is also responsible for much of the downward revision in the national average price forecast. In British Columbia, activity appears to be stabilizing somewhere in between the highs of early 2016 and the lows of late 2016 and early 2017. Meanwhile, sales activity is still running at lower levels while supply remains elevated in the natural resource-intensive provinces of Alberta, Saskatchewan, and Newfoundland and Labrador. This has resulted in somewhat softer price trends in the two western provinces and more pronounced price declines in Newfoundland and Labrador. To varying degrees, housing markets in Manitoba, Northern and Eastern Ontario, Quebec, New Brunswick, Nova Scotia and Prince Edward Island had a breakout year in 2016, with rising sales drawing down previously elevated levels of supply. Inventories in these regions have continued to decline this year. Tightened mortgage rules, higher mortgage default insurance premiums, changes to Ontario housing policies and higher interest rates are factors that will continue to lean against housing market activity over the rest of the year and into 2018. Additional interest rate increases and further tightening of mortgage regulations represent downside risks to the sales forecast, while improving Canadian economic fundamentals represent upside risks. 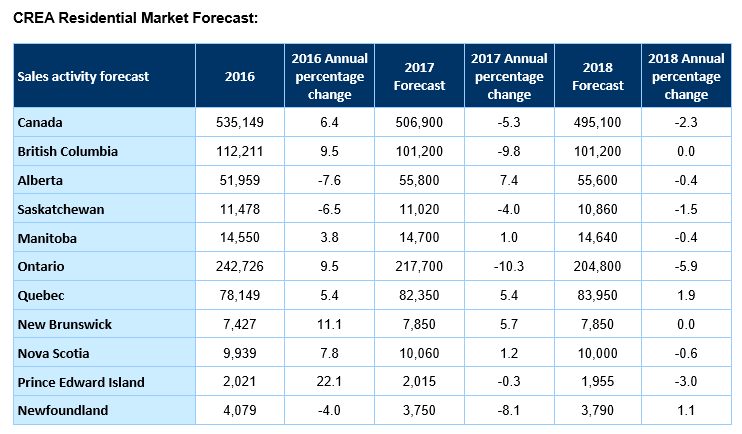 Nationally, sales activity is forecast to decline by 5.3% to 506,900 units in 2017, which represents a drop of more than 20,000 transactions from CREA’s forecast published in June. The decline stems almost entirely from the downward revision to the forecast Ontario home sales. Sales in British Columbia and Ontario are both now projected to decline by about 10% in 2017 compared to all-time records set in 2016. 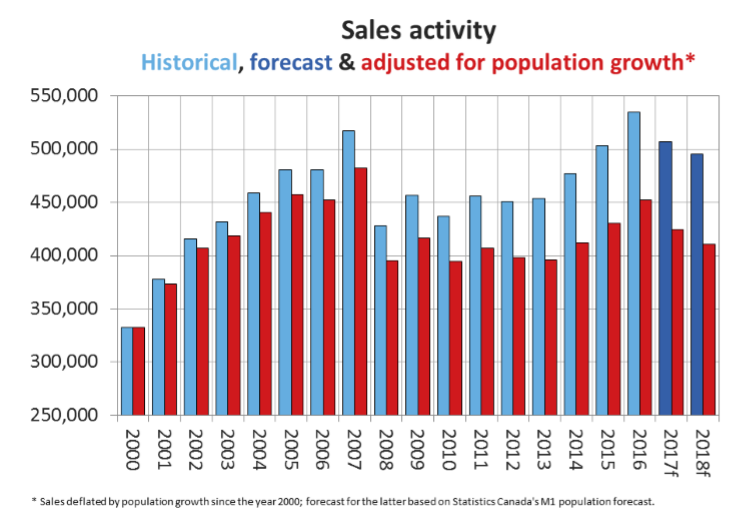 Newfoundland & Labrador is also forecast to see a sizeable decline in sales in 2017 (-8.1%), continuing a softening trend that stretches back nearly a decade. A smaller decline in activity is forecast for Saskatchewan (-4%). Alberta is still projected to post the largest increase in activity in 2017 (+7.4%); however, the increase still leaves sales below the provincial 10-year average. Sales this year are also forecast to rise in Quebec (+5.4% and New Brunswick (+5.7%), rise modestly in Manitoba, Nova Scotia, and remain little changed in Prince Edward Island. Manitoba and Quebec are the only two provinces expected to set new annual sales records in 2017, while sales in New Brunswick and Prince Edward Island are on track to come in just short of all-time record levels. The national average price is forecast to rise by 3.4% to $506,700 in 2017. This marks a downward revision to the previous forecast, mostly reflecting fewer high priced sales in the Greater Golden Horseshoe region. While Ontario is still forecast to post a sizeable year-over-year gain in 2017 (+8.7%), this is a large downward revision to the previously forecast increase. Prince Edward Island is expected to post a similar average home price gain in 2017 (+7.4%), followed by Quebec (+4.5%), New Brunswick (+4.4%), Nova Scotia (+3.5%), Manitoba (+2.8%), British Columbia (+2.2%) and Alberta (+1.2%). Newfoundland and Labrador (-4.3%) and Saskatchewan (-1.6%) are the only provinces where average price is projected to decline in 2017, in line with elevated supply relative to demand in these provinces. In 2018, national sales are forecast to number 495,100 units, representing a decline of 2.3% compared to the 2017 forecast. As is the case this year, most of the annual decline in sales next year reflects an expected decline in Ontario sales, with activity anticipated to remain well below the record-levels logged in early 2017. The national average price is forecast to edge lower by 0.6% to $503,500 in 2018, in large part reflecting a record number of high-end home sales in and around Toronto in early 2017 that is not expected to reoccur in 2018. Further expected interest rate increases will hold sales in check in the Greater Vancouver and Toronto Areas. As a result, the average price is forecast to hold steady in 2018 in British Columbia and edge back by 1.1% in Ontario. In an extension of trends for 2017, average prices in 2018 are forecast to rise by more than the rate of consumer price inflation in Quebec and New Brunswick, decline further in Saskatchewan and Newfoundland and Labrador and either remain little changed or rise modestly next year in all other provinces. Ottawa, ON, August 15, 2017 – According to statistics released today by The Canadian Real Estate Association (CREA), national home sales declined further in July 2017. National home sales fell 2.1% from June to July. Actual (not seasonally adjusted) activity in July stood 11.9% below last July’s level. The number of newly listed homes edged back by 1.8% from June to July. The MLS® Home Price Index (HPI) was up 12.9% year-over-year (y-o-y) in July 2017. The national average sale price edged down by 0.3% y-o-y in July. The number of homes sold via Canadian MLS® Systems fell 2.1% in July 2017, the fourth consecutive monthly decline. While the monthly decline was about one-third the magnitude of those in May and June, it leaves sales activity 15.3% below the record set in March. Sales were down from the previous month in close to two-thirds of all local markets, led by the Greater Toronto Area (GTA), Calgary, Halifax-Dartmouth and Ottawa. Actual (not seasonally adjusted) activity was down 11.9% on a year-over-year (y-o-y) basis in July 2017. Sales were down from year-ago levels in about 60% of all local markets, led by the GTA and nearby markets. National sales net of activity in the Greater Golden Horseshoe region was little changed from one year ago. The number of newly listed homes slipped further by 1.8%, led by the GTA. Many other markets in the Greater Golden Horseshoe region have also seen new supply pull back recently after having jumped immediately following the Ontario government’s announcement of its Fair Housing Plan in late April. New listings were also down in Calgary, Edmonton, Montreal and northern British Columbia, with the lattermost region having been hit by wildfires. With sales down by about the same amount as new listings in July, the national sales-to-new listings ratio was little changed at a well-balanced 53.5%. By contrast, the ratio was in the high-60% range in the first quarter of 2017. A national sales-to-new listings ratio of between 40 and 60 percent is generally consistent with balanced national housing market, with readings below and above this range indicating buyers’ and sellers’ markets respectively. Considering the degree and duration to which current market balance is above or below its long-term average is a more sophisticated way of gauging whether local conditions favour buyers or sellers. (Market balance measures that are within one standard deviation of the long-term average are generally consistent with balanced market conditions). Based on a comparison of the sales-to-new listings ratio with its long-term average, more than 60% of all local markets are in balanced market territory. In the Greater Golden Horseshoe region, housing markets that recently favoured sellers have become more balanced, with some beginning to tilt toward buyers’ market territory. There were 5.2 months of inventory on a national basis at the end of July 2017, the highest level since January 2016. This was up from five months in June and up by more than a full month from where it stood in March. 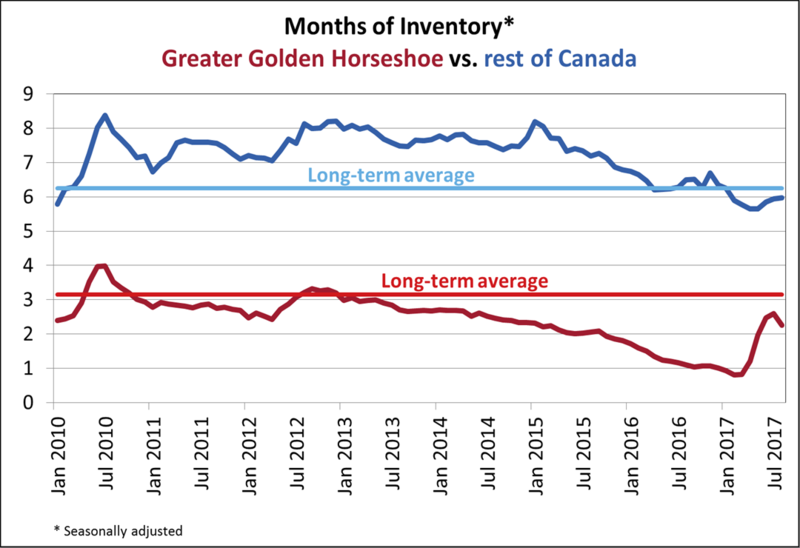 The number of months of inventory in the Greater Golden Horseshoe region is up sharply from where it stood prior to the Ontario government housing policy changes announced in April 2017. For the region as a whole, there were 2.6 months of inventory in July 2017. While this remains below the long-term average of just over 3 months, it is more than triple the all-time low of 0.8 months reached in February and March. The Aggregate Composite MLS® HPI rose by 12.9% y-o-y in July 2017, representing a further deceleration in y-o-y gains since April. The deceleration in growth from June to July was the result of softening prices in the Greater Golden Horseshoe housing markets tracked by the index. Benchmark home price growth accelerated in Ottawa (+5.8% overall, led by a 6.8% increase in two-storey single family home prices) and Greater Montreal (+4.9% overall, led by a 7% increase in prices for townhouse/row units). Prices were up 5.4% overall in Greater Moncton, led by one-storey single family home prices which set a new record (+8.9%). The actual (not seasonally adjusted) national average price for homes sold in July 2017 was $478,696, down 0.3% from where it stood one year earlier. This was the first y-o-y decline in the measure since February 2013, reflecting fewer sales in the GTA and Greater Vancouver on a y-o-y basis. Because these 2 markets nonetheless remain highly active and expensive, Greater Vancouver and Greater Toronto upwardly skew the national average price. Excluding these two markets from calculations trims almost $100,000 from the national average price ($381,297). Ottawa, ON, July 17, 2017 – According to statistics released today by The Canadian Real Estate Association (CREA), national home sales cooled further in June 2017. June sales were down from the previous month in 70% of all local markets, led overwhelmingly by the Greater Toronto Area (GTA). Monthly declines were also posted in all surrounding Greater Golden Horseshoe housing markets, the Lower Mainland of British Columbia, Kingston, Montreal and Quebec City. Benchmark price gains slowed on a y-o-y basis in Greater Toronto, Guelph, and particularly in Oakville-Milton but remain well above year-ago levels (Greater Toronto: +25.3% y-o-y; Guelph: +25.4% y-o-y; Oakville-Milton: +17.4% y-o-y). Ottawa, ON, June 15, 2017 – According to statistics released today by The Canadian Real Estate Association (CREA), national home sales posted a sizeable decline in May 2017. National home sales dropped 6.2% from April to May. Actual (not seasonally adjusted) activity in May stood 1.6% below last May’s level. The number of newly listed homes edged up 0.3% from April to May. 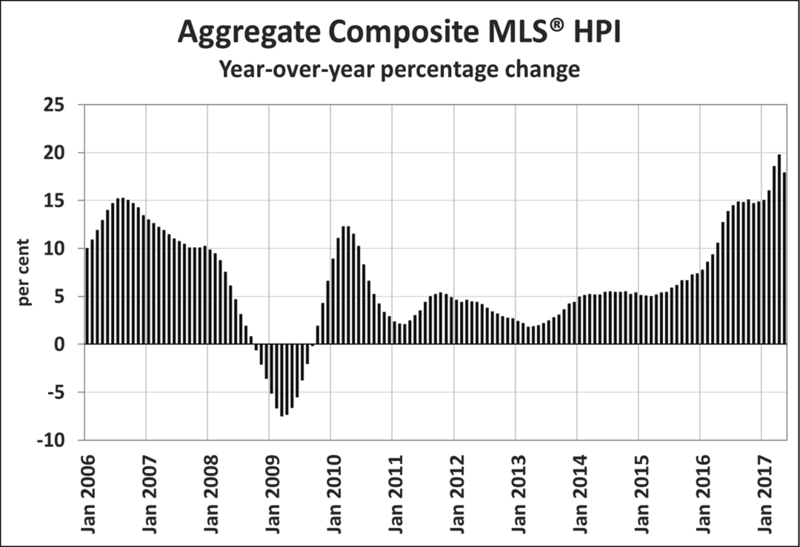 The MLS® Home Price Index (HPI) was up 17.9% year-over-year (y-o-y) in May 2017. The national average sale price advanced by 4.3% y-o-y in May. The number of homes sold via Canadian MLS® Systems fell by 6.2% in May 2017 compared to April. The month-over-month (m-o-m) percentage decline was the largest since August 2012. While May sales were down from the previous month in about half of all local markets, the sizeable national decline largely reflects a 25.3% m-o-m drop in the Greater Toronto Area (GTA). Activity was also down significantly from the previous month among other housing markets across the Greater Golden Horseshoe region, including Oakville-Milton, Hamilton-Burlington and Barrie. By contrast, activity rose to multi-year highs in Montreal and Quebec City. Actual (not seasonally adjusted) activity was down 1.6% on a year-over-year basis in May, with year-over-year (y-o-y) gains in about 60% of all local housing markets offset by the sharp drop in the GTA (20.8% y-o-y). Calgary, Edmonton, Ottawa and Montreal were among a number of urban centres where May sales surpassed year-ago levels. The number of newly listed homes edged up a further 0.3% in May following April’s jump of almost 10%. New listings in May remained high in and around the GTA; however, the York Region of the GTA posted the largest month-over-month decline in new supply. Similar percentage declines were also evident for new listings in Oakville-Milton and Barrie. With sales down considerably in May, the national sales-to-new listings ratio moved out of sellers’ territory and back into balanced market territory for the first time since late 2015. The ratio stood at 56.3% in May 2017, down from 60.2% in April and the high-60% range over the first three months of this year. The ratio was above 60% in more than half of all local housing markets in May, the majority of which are located in British Columbia and southwestern Ontario. The ratio is above 70% for Greater Vancouver and the Fraser Valley and above 60% for Montreal. By contrast, the ratio softened sharply in the GTA, closing out the month at 41%. There were 4.7 months of inventory on a national basis at the end of May 2017, up from 4.3 months in April and 4.1 months in March. This returns the measure to where it was for much of 2016. With new listings having surged and sales having declined in some markets within the Greater Golden Horseshoe, the number of months of inventory in the region is up from all-time lows. That said, housing markets in the region remain among the tightest in Canada, with most urban centres in the region still registering less than two months of inventory. The Aggregate Composite MLS® HPI rose by 17.9% y-o-y in May 2017 compared to 19.8% in April. Price gains slowed sharply for single family homes. Price gains accelerated for apartment units, which posted the largest y-o-y gains in May (+20.5%). Meanwhile, prices gains braked for benchmark low-rise homes (townhouse/row units: +19.3% y-o-y; two-storey single family homes: +18.4% y-o-y; one-storey single family homes: +14.5% y-o-y). After having dipped in the second half of last year, home prices in the Lower Mainland of British Columbia have been recovering and have either reached new heights or are trending toward them (Greater Vancouver: +8.8% y-o-y; Fraser Valley: +14.7% y-o-y). Meanwhile, y-o-y benchmark home price increases remained in the 20% range in Victoria and elsewhere on Vancouver Island. Price gains slowed on a y-o-y basis in Greater Toronto and particularly in Oakville-Milton but remain well above year-ago levels (Greater Toronto: +29% y-o-y; Oakville-Milton: +23.9% y-o-y). Price growth remained in the mid-20% on a y-o-y basis in Guelph. Calgary and Regina traded places in May, with Calgary prices having posted the first y-o-y gain (+0.2%) in almost two years and Regina prices having moved into negative territory (-1.7%) for the first time since January 2016. Saskatoon home prices remained down from year-ago levels (-2.8%) for the 22nd consecutive month. Benchmark home prices rose by more than the rate of overall consumer price inflation in Ottawa (+4.4% overall, led by a 5.4% increase in two-storey single family home prices), Greater Montreal (+3.6% overall, led by a 4.6% increase in two-storey single family home prices) and Greater Moncton (+6.1% overall, led by a 13.1% increase in prices for townhouse/row units). The actual (not seasonally adjusted) national average price for homes sold in May 2017 was $530,304, up 4.3% from where it stood one year earlier. The national average price continues to be pulled upward by sales activity in Greater Vancouver and Greater Toronto, which are two of Canada’s most active and expensive housing markets. Excluding these two markets from calculations trims more than $130,000 from the national average price ($398,546). OTTAWA, March 27, 2017 – The Canadian REALTORS Care® Foundation has named Laura-Leah Shaw, of Vancouver, British Columbia, the recipient of its national award – the Canadian REALTORS Care® Award 2017 Proudly Presented by REM. Shaw, of RE/MAX Crest Realty Westside, was selected because of the multitude of charities and activist organizations she actively supports. From supporting Vancouver-based homeless shelters and spearheading animal rights’ groups, to dropping off items at city food banks and being the longest-serving volunteer of the REALTORS Care® Blanket Drive, Shaw fully devotes herself to helping others. For more than 15 years, Shaw has been collecting healthy food options for the Lookout Society, an emergency aid organization helping Vancouver’s most vulnerable. Last year, she delivered more than 2,500 boxes of food – as well as furniture, clothes and appliances – to the Lookout Society and similar organizations in the city’s poorest neighbourhoods. She was also the first REALTOR® to join the HomeStart Foundation more than 11 years ago, helping those who are less fortunate complete their home. As well as going above and beyond caring for humans, Shaw is passionate about the welfare of animals. She’s president of the Anti-Vivisection Society of British Columbia, advocating for an end to animal testing, has been volunteering with the Vancouver Humane Society for 12 years and estimates having saved the lives of thousands of animals. In recognition of the award, the Canadian REALTORS Care® Foundation will be donating $5,000 to Animal Justice Canada – a registered non-profit animal law organization close to Shaw’s heart. The Canadian REALTORS Care® Award was established in 2015 to honour REALTORS® who do outstanding charitable work in the communities where they live and work. The Foundation’s inaugural winner was Vince Mirabelli of Thunder Bay, Ontario. A selection committee reviews nominees and chooses a winner based on the REALTOR®’s personal contribution and commitment to supporting one or more registered charities in Canada. The Canadian REALTORS Care® Foundation is the REALTOR® community’s national charitable foundation, founded in 2007 and funded by the Canadian Real Estate Association. Our Foundation is dedicated to inspiring, supporting and sharing REALTORS®’ charitable achievements in their communities and raising awareness about the charities they care about. From 2012 to 2015 alone, the Canadian REALTOR® community reported giving in excess of $91.2 million to the various charities close to their hearts. Please visit www.REALTORSCare.ca to learn more about how REALTORS® are making a difference in communities across Canada. The number of months of inventory is another important measure of the balance between housing supply and demand. It represents how long it would take to completely liquidate current inventories at the current rate of sales activity. 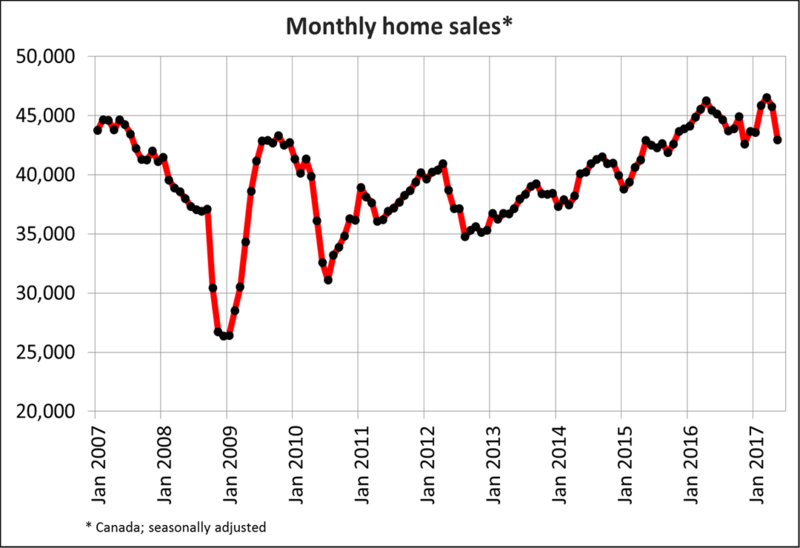 Ottawa, ON, June 15, 2015 - According to statistics released today by The Canadian Real Estate Association (CREA), national home sales activity posted a fourth consecutive month-over-month increase in May 2015. National home sales rose 3.1% from April to May. 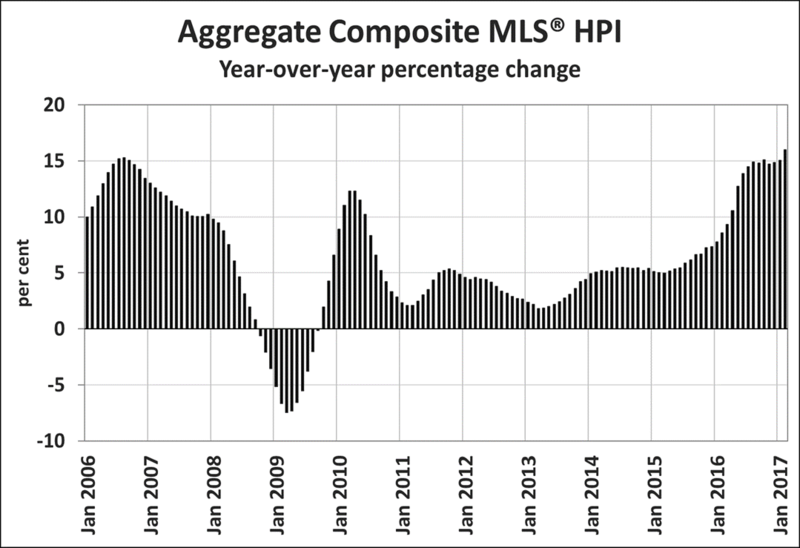 Actual (not seasonally adjusted) activity stood 2.7% above May 2014 levels. The number of newly listed homes was little changed from April to May. The MLS® Home Price Index (HPI) rose 5.17% year-over-year in May. The national average sale price rose 8.1% on a year-over-year basis in May; excluding Greater Vancouver and Greater Toronto, it increased by 2.4%. May sales were up from the previous month in about 60 per cent of all local markets, led by increases in the Greater Toronto Area, Calgary, Edmonton, Ottawa and Montreal. Actual (not seasonally adjusted) activity in May 2015 stood 2.7 per cent above levels reported for the same month last year and 5.7 per cent above the 10 year average for the month. Sales were up on a year-over-year basis in about half of all local markets, led by activity in the Lower Mainland of British Columbia, Greater Toronto and Montreal. The number of newly listed homes was virtually unchanged (-0.2 per cent) in May compared to April. This reflects an even split between housing markets where new listings rose and where they fell, with little monthly change for new listings in most of Canada’s largest and most active urban markets. The national sales-to-new listings ratio was 57.6 per cent in May, up from a low of 50.4 per cent in January when it reached its most balanced point since March 2013. The ratio has risen steadily along with sales so far this year as new supply has remained little changed. A sales-to-new listings ratio between 40 and 60 per cent is generally consistent with balanced housing market conditions, with readings above and below this range indicating sellers’ and buyers’ markets respectively. The ratio was within this range in about half of local housing markets in May. About a third of local markets were above the 60 per cent threshold in May, comprised mostly of markets in and around the Greater Toronto Area and markets in British Columbia. The national balance between supply and demand has tightened since the beginning of the year, when buyers had more negotiating power than they had in nearly two years. There were 5.6 months of inventory on a national basis at the end of May 2015, its lowest reading in three years. Year-over-year price growth accelerated in May in all Benchmark home categories tracked by the index with the exception of one-storey single family homes. Two-storey single family homes continue to post the biggest year-over-year price gains (+7.18 per cent), with more modest increases for one-storey single family homes (+4.11 per cent), townhouse/row units (+4.09 per cent) and apartment units (+2.91 per cent). Year-over-year price growth varied among housing markets tracked by the index. Greater Vancouver (+9.41 per cent) and Greater Toronto (+8.90 per cent) continued to post by far the biggest year-over-year price increases. By comparison, Fraser Valley, Victoria, and Vancouver Island prices all recorded year-over-year gains of about four per cent in May. Price gains in Calgary continued to slow, with a year-over-year increase of just 1.21 per cent in May. This was the smallest gain in more than three years and the eleventh consecutive monthly slowdown in year-over-year price growth. Elsewhere, prices held steady on a year-over-year basis in Saskatoon and Ottawa, rose slightly in Greater Montreal and fell by about three per cent in Regina and Greater Moncton. The actual (not seasonally adjusted) national average price for homes sold in May 2015 was $450,886, up 8.1 per cent on a year-over-year basis. The national average home price continues to be upwardly distorted by sales activity in Greater Vancouver and Greater Toronto, which are among Canada’s most active and expensive housing markets. If these two markets are excluded from calculations, the average is a more modest $344,988 and the year-over-year gain is reduced to 2.4 per cent. Provide second level of support; participate in the design, architecture, deployment, monitoring maintenance and turning of highly available physical and virtual systems, web applications and infrastructure to deliver quality IT services, optimize performance and maintain service levels. Ottawa, ON, May 29, 2015 -The Bank of Canada announced on May 27th, 2015 that it was keeping its trend-setting overnight lending rate at 0.75 per cent. The Bank of Canada announced on May 27th, 2015 that it was keeping its trend-setting overnight lending rate at 0.75 per cent. Economic growth in the first quarter was weaker than the Bank expected, but it “expects a return to solid growth in the second quarter.” It still believes that exports and business investment will pick up and that the Canadian economy will grow by just under 2 per cent this year. The Bank thinks the economic fallout from low oil prices will be neatly limited to the first quarter. If it proves to be longer lasting, the Bank may downgrade its economic outlook again and further delay raising interest rates. Financial markets currently expect the Bank to start raising interest rates in the second half of 2016. The Bank sets interest rates so that inflation stays around 2% (plus or minus 1%). Economic growth plays an important role in the Bank’s assessment of the outlook for inflation. Its announcement said, “seeing through the various temporary factors, the Bank estimates that the underlying trend of inflation is 1.6 to 1.8 per cent, consistent with persistent slack in the economy.” This makes clear the Bank has little reason to raise its trend-setting Bank rate anytime soon. The Bank’s announcement ended by saying “a number of complex adjustments are under way.” and suggested “their net effect will need to be assessed as more data become available in the months ahead.” In the meantime, interest rates will remain supportive for Canadian home sales and prices. As of May 27th, 2015, the advertised five-year lending rate stood at 4.64 per cent, unchanged from the previous Bank rate announcement on April 15th and down 0.15 percentage points from one year ago. The next interest rate announcement will be on July 15th, 2015 and will be accompanied by an update to the Monetary Policy report. 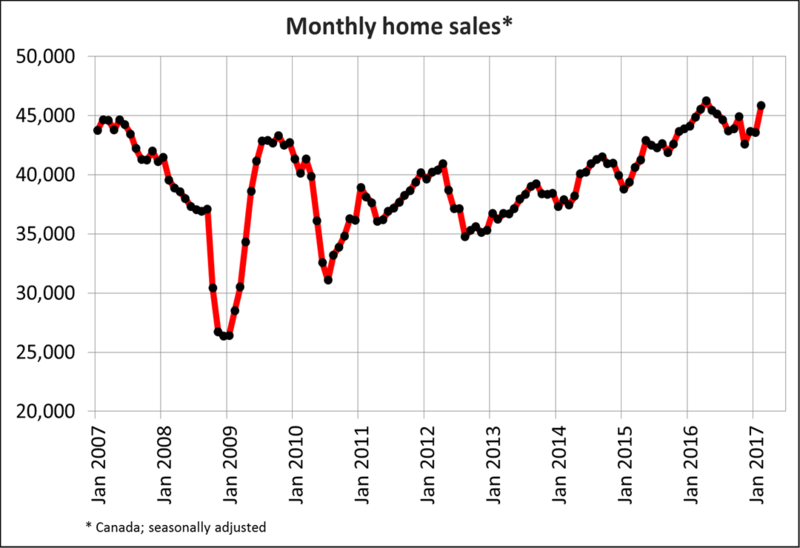 Ottawa, ON, May 15, 2015- According to statistics released today by The Canadian Real Estate Association (CREA), national home sales activity posted a third consecutive month-over-month increase in April 2015. Ottawa, ON, April 15, 2015 - The Bank of Canada announced on April 15th, 2015 it was keeping its trend-setting overnight lending rate at 0.75 per cent. The Bank of Canada announced on April 15th, 2015 it was keeping its trend-setting overnight lending rate at 0.75 per cent. While official economic growth statistics for the first quarter of 2015 won’t be available until the end of May, the Bank estimates that Canada’s economy was stuck in neutral. Governor Poloz had already telegraphed as much in an interview with the Financial Times and it should come as no surprise given the impact of the drop in oil prices this year. In its interest rate announcement, the Bank made it clear that it thinks the worst of the damage to the Canadian economy from lower oil prices is behind us. It expects economic activity to bounce back in the second and third quarters even more strongly than previously predicted due mainly to an anticipated increase in non-energy exports. The rebalanced forecast allows the Bank to maintain its view that inflation will return to its two per cent target by the end of 2016. At this point, that means the goalposts for the first interest rate hike have not moved. Most Bay Street economists expect the Bank to keep interest rates on hold until late 2016. That said, the Bank identified greater than anticipated economic fallout from oil prices as the number one risk to its forecast. If damage to the Canadian economy from lower oil prices worsen or drag on for longer than anticipated, it may be forced to again downgrade its next economic forecast and perhaps trim interest rates in July. As of April 15th, 2015, the advertised five-year lending rate stood at 4.64 per cent, down 0.1 percentage points from the previous Bank rate announcement on March 4th, and down 0.35 percentage points from one year ago. The next interest rate announcement will be on May 27th, 2015. The next update to the Monetary Policy Report will be on July 15th, 2015. 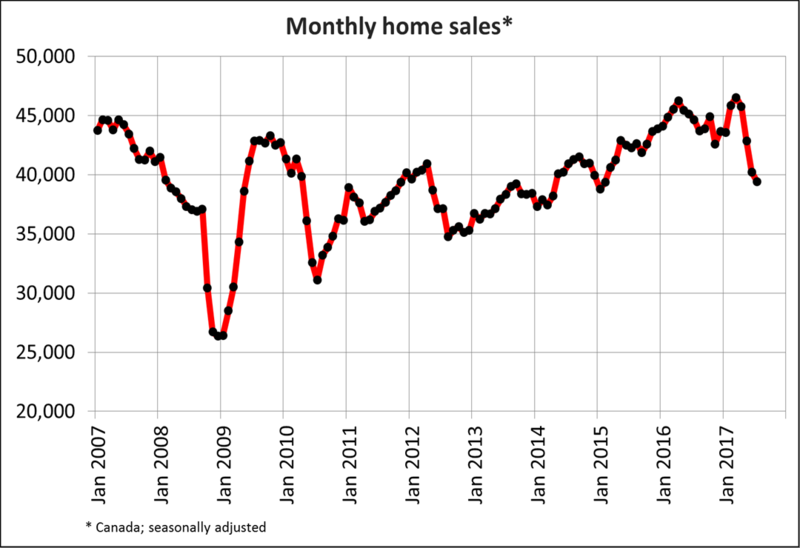 Ottawa, ON, April 15, 2015 - According to statistics released today by The Canadian Real Estate Association (CREA), national home sales activity was up on month-over-month basis in March 2015. National home sales edged up 4.1% from February to March. Actual (not seasonally adjusted) activity stood 9.5% above March 2014 levels. The number of newly listed homes rose 1.8% from February to March. The MLS® Home Price Index (HPI) rose 4.95% year-over-year in March. The national average sale price rose 9.4% on a year-over-year basis in March; excluding Greater Vancouver and Greater Toronto, it increased by 2.4%. The number of home sales processed through the MLS® Systems of Canadian real estate Boards and Associations rose by 4.1 per cent in March 2015 compared to February. March sales were up from the previous month in nearly two-thirds of all local markets, led by Greater Vancouver, Fraser Valley, Calgary and Edmonton. Despite the monthly rebound, Calgary and Edmonton sales came in below the 10 year average for the month of March. Year-over-year price gains for single family homes in Greater Vancouver and Greater Toronto have exceeded those in other housing markets tracked by the MLS® HPI throughout the first quarter of 2015 (Chart A). Actual (not seasonally adjusted) activity in March stood 9.5 per cent above levels reported in March 2014 and slightly above the 10 year average for the month. March sales failed to lift activity recorded during the first quarter above its 10 year average. First quarter sales were below their 10 year average in most local housing markets. The number of newly listed homes rose 1.8 per cent in March compared to February. The rebound in Greater Toronto more than offset the continuing pullback of new supply in Calgary, where it had climbed sharply toward the end of last year but now stands at a multi-year low. The national sales-to-new listings ratio was 53.9 per cent in March, up from 52.7 per cent in February and 50.4 per cent in January. A sales-to-new listings ratio between 40 and 60 per cent is generally consistent with balanced housing market conditions, with readings above and below this range indicating sellers’ and buyers’ markets respectively. The ratio was within this range in about 60 per cent of all local housing markets in March. There were 6.1 months of inventory on a national basis at the end of February 2015, down from 6.3 months in February and 6.5 months in January. While both the sales-to-new listings ratio and months of inventory measures have tightened at the national level in the past few months, they remain firmly entrenched in balanced market territory. Moreover, both measures of housing market balance indicate that upward pressure on selling prices is subsiding in an increasing number of local markets. The Aggregate Composite MLS® HPI rose by 4.95 per cent on a year-over-year basis in March. This marks the first year-over-year increase of less than 5% since last May and its smallest gain since January 2014 (Chart B). Year-over-year price growth decelerated in March for apartment units, while accelerating slightly for other Aggregate Benchmark housing types tracked by the index. Single family home sales continue to post the biggest year-over-year price gains (+5.83 per cent), led by two-storey single family homes (+6.66 per cent). By comparison, the rise in selling prices was more modest for townhouse/row units (+4.55 per cent), one-storey single family homes (+4.41 per cent) and apartment units (+2.36 per cent). Price gains varied among housing markets tracked by the index. Greater Toronto (+7.85 per cent) and Greater Vancouver (+7.19 per cent) posted the biggest year-over-year increases. This was followed by Calgary at 4.13 per cent, which was a markedly smaller gain compared to those posted last year and the smallest since August 2012. In other markets tracked by the index, prices were up compared to year-ago levels by between two-and-a-half and three per cent in Fraser Valley, Victoria, and Vancouver Island, while remaining little changed in Saskatoon, Ottawa, and Greater Moncton. Prices also ticked up by half of one per cent in Greater Montreal, while falling four per cent in Regina (Table 1). The actual (not seasonally adjusted) national average price for homes sold in March 2015 was $439,144, up 9.4 per cent on a year-over-year basis. The national average home price is being increasingly skewed by sales activity in Greater Vancouver and Greater Toronto, which are among Canada’s most active and expensive housing markets. Excluding these two markets from the calculation, the average price is a relatively more modest $332,711 and the year-over-year gain shrinks to just 2.4 per cent.